Design competitions permit a freedom of creativity that usual project formats don’t allow, which brings significant innovations and most of the new trends in urban planning, design and architecture. In some ways, competitions are essential to imagine new solutions to improve our environment because they don’t limit the creativity and opportunities to think differently. Design competitions date back over two millennia and include a war memorial for the Acropolis in 448 BCE. Numerous famous historic and current projects are also the result of design competitions including the White House; the Eiffel Tower; the 9/11 Memorial; and Park Russia, the largest theme park in Europe. Design competitions are ideal for large-scale, highly visible projects that have sufficient time and budget to conduct the competition program. These projects also offer the competitors an opportunity to win prizes/contracts, develop public relationships, engage in project research and design, attract media attention and acquire further contracts. These opportunities collectively may be much more valuable than being awarded a contract via the traditional bidding process. 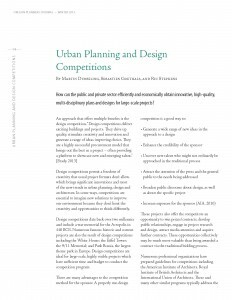 The article ‘Urban Planning and Design Competitions’ by Martin Dubbeling, Sebastien Goethals, and Ric Stephens is published in the Oregon Planners’ Journal, Winter 2013, page 14-16.